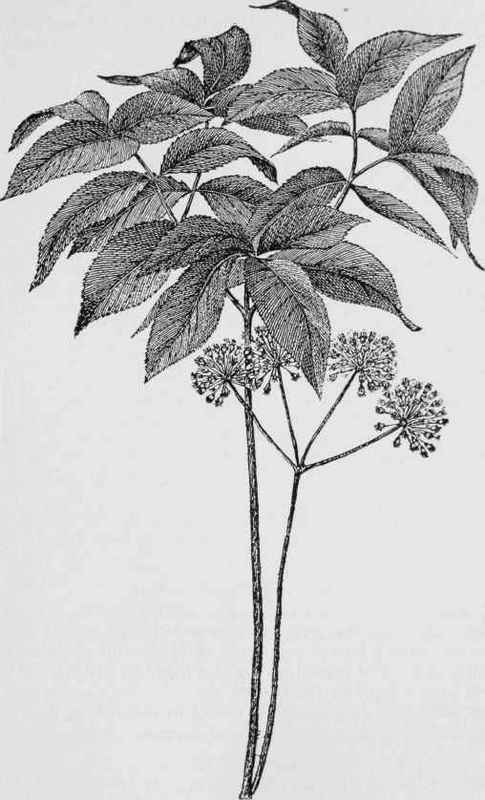 Aralia nudicaulis - Family, Ginseng. The root of this plant, although not the officinal root which the soda-fountain clerk uses (officinal meaning that which has commercial value), is sometimes used to flavor summer drinks. A single, long-stalked leaf rises to the height of a foot, divided into oblong, pointed leaflets, 5 leaflets on each of 3 divisions. To the unbotanical eye there are 3 compound leaves, each 5-divided, springing from the stem. Lower down the flowers grow on separate scapes in umbels, 2 to 7 umbels springing from the same center. May and June.